From traditional brochure sites, which give a basic company outline of a firm and its products and services, to dynamic multi-media sites that allow for dazzling animation, to customized e-commerce sites, AffordableConsulting.com has the technical know-how complete any task, no matter how large or small. What sets AffordableConsulting.com apart from the rest of the pack of companies boasting similar services is our customer service. Many if not most of our clients have had former relationships with "web designers" and they all share with us the horror stories of bloated pricing, staff that goes missing for days and weeks at a time, and generally folks that do not take the time to understand their business. AffordableConsulting.com functions as your advertising, marketing, and web department and we take the time to insure that we understand your business so that we can then offer the solutions that will work... FOR YOU! View below several of our clients, visit their sites and read their story and how we solved their issues and helped to grow their business. Non-Profits hold a special place in our hearts, as most of our staff serve on non-profit boards and participate in volunteer efforts with several non-profits. All of our non-profits receive specialized pricing on our services. Recently renovated, The Family Tree has been offering low cost, high quality education and mental health services in Acadiana for Decades. 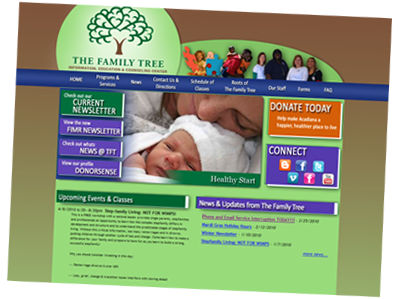 When they first approached us they shared their desire to create an online site that would allow their patients and students to access their services. As most non-profits realize – stretching every dollar is paramount to accomplishing your goals. The Family Tree wanted an affordable solution to allow them to manage their Educational Classes remotely and to track their students for better reporting. We accomplished this for them with a completely customized system that now allows them to post, register and maintain all their current classes – all online from any internet connection throughout the world. This has dramatically reduced their labor costs and allows for real time reporting. Formerly KQIS, Big 102.1 is a client that we have been serving for well over 8 years now. We are currently on their 5th design structure and with each redesign we have been able to help them reach more and more listeners. Wanting to insure that they never fall into a “corporate cookie cutter,” Big 102.1 approached us to serve their listeners with a vehicle to interact with their on-air talent. 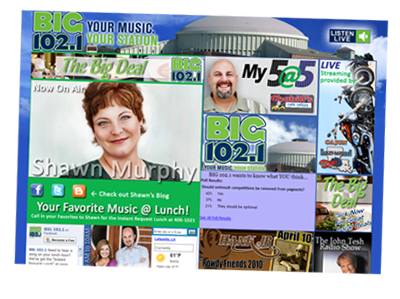 And from our early attempts at streaming (one of the first in Acadiana to do so) to now linking up with Facebook, Twitter and other social media sites – Big 102.1 has some of the most loyal and active fan bases in the region. Not long ago, we were approached to find an affordable solution to a start-up business online. The folks at The Rally Towel asked us to come up with a simple brochure site and a method for them to sell their products. 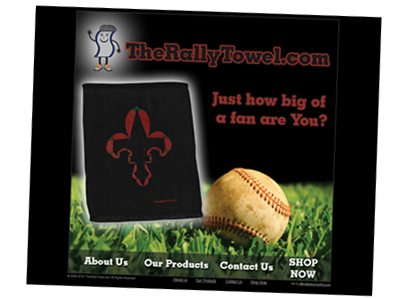 The site rotates depending on the sport season we are currently enjoying and showcases the designs currently available at TheRallyTowel.com. Simple, clean… Effective! Another long term client of ours, Joey’s is a main stay of Acadiana. 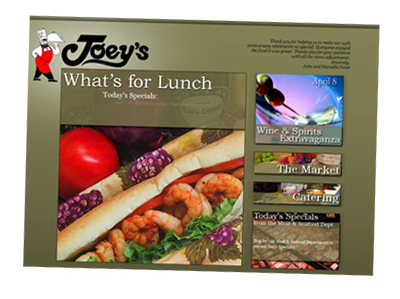 Joey had several unique issues that presented him with several challenges – now JoeysLafayette.com is in its 3rd design and offers not only a full shopping cart system to buy most of the products Joey’s sells in its store ready to deliver to your door… but it also offers a fully customized Catering System which allows the staff at Joey’s to insure your special event is successful and stress free. JoeysLafayette.com allows visitors to completely customize and request a quote for any sort of catering event in the area. Whether the event is going to be at your home or office – or even if you need a location – JoeysLafayette.com has your solutions – and some of the best food you will ever taste!